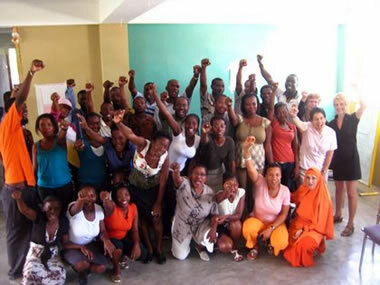 In August 2009, four North American teachers traveled to Port au Prince, Haiti to conduct an intensive six-day teacher training program. The training was conducted in two sessions. 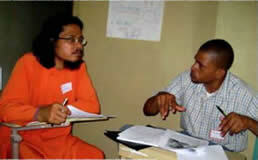 The first session consisted of local acharyas, margiis, and lead teachers. This group engaged in three days of educational leadership training focused on hands on activities for the classroom and professional development techniques. In a follow up session, this group became the trainers for teachers from two Neohumanist schools and several surrounding schools. One outcome of the entire training program is that several trainers have now been hired to continue offering professional development support on Neo-Humanist pedagogy to teachers in Port au Prince and Sources Chaudes. What follows are reflections on the training. Was it presumptuous of us to travel to another country, culture and language with the assumption that we could understand and meet their needs? How could we make theoretical paradigms like Bloom’s Taxonomy of Learning Domains and the Neohumanist approach to education come alive? Was it reasonable to expect that the support group of trainers (locals from our first training session) would be able to assume the responsibility of training the teachers? However, as the training days wore on, what we found – to our immense relief and delight – was that rather than having misjudged the task, our training program had become a runaway success. Another pleasant surprise was that our learning curve probably rivaled that of our trainees. Here are some things that we learned. We discovered that through our team’s collaborative, on-going dialogue, we were able to anticipate the gaps and kinks in understanding, enrich each other’s thinking and create and adapt materials as needed. Having observed our learners’ responses, we were able to accurately match our curriculum to their needs. Another thing learned was how eager our trainees were in both sessions for practical yet enlivening pedagogy with an immediate application to the classroom. This was compounded by their delight with theoretical constructs when carefully disseminated through learner-centered activities. We gave our trainees sufficient time to encounter new ideas, apply, discuss and evaluate. Finally, through the medium of challenging yet scaffolded activities, group work and peer mentoring, our trainees’ voices were heard and valued. They had pooled their knowledge to build upon each other’s ideas. They will now have this bank of shared experience to draw upon throughout the coming year. 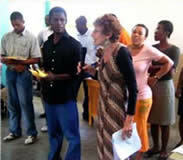 Ultimately, the success of the program was in large part due to the modeling and application of Neo-Humanist pedagogy. By addressing all learning styles, multiple intelligences and temperaments within the training, underscored by time set aside for kiirtan and group meditation, we wove together a joyful learning community. Our hope is that this work will continue to grow through the efforts of the local educational team and the continued partnership with visiting professionals. In the end, while we were physically exhausted by our hard work in 100 degree temperatures, we were spiritually exhilarated and re-energized by the enthusiastic response and love of our Haitian colleagues.